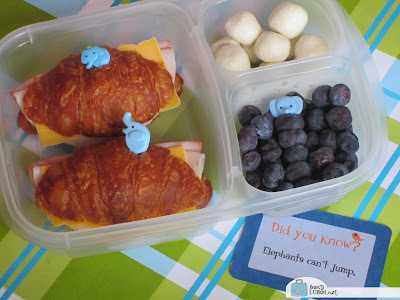 The boy is still loving his elephants, so we still need to include them in his lunches! I have enough elephant related gear to change up sandwich shapes, picks, and more. 6 years of collecting it and you end up with a heck of a lot of elephants! I even found a Lunchbox Love note that referenced elephants and set it aside, just for him. Ben has two ham, turkey and cheese sandwiches on mini croissants (found them on sale at the commissary, yum! ), along with blueberries and Greek on the Go Strawberry Granola Bites. We are loving these, they are yogurt covered and so yummy, we found them at Sam's. He also took, not pictured, applesauce in our new Squeezems pouches, a tube of Chobani Champions blueberry yogurt and a granola bar. The kids have recess and snack time in the morning and afternoon, then they stay after school for Kung Fu, so I went with a regular sized lunch and extra snacks for each event. We're packed in our EasyLunchboxes and using our Lunchbox Love notes today!